Association of blood vitamin D levels with non-communicable diseases in older people. Gender-specific effects of omega-3 polyunsaturated fatty acids supplementation in metabolic syndrome. Effect of background dietary fats on omega-3 polyunsaturated fatty acids induced metabolic changes in healthy humans. I always believed in 'you are what you eat' and 'let food be thy medicine' and was keen to provide scientific basis for prevention of chronic disease by improved nutrition and nutritional supplements. I believe that improvements in life expectancy must accompany superior quality of life that can only be achieved by lifestyle alterations, including improved nutrition and nutritional supplements. Prevention is better than cure and safe and efficacious strategies are required for enjoying a disease-free life. 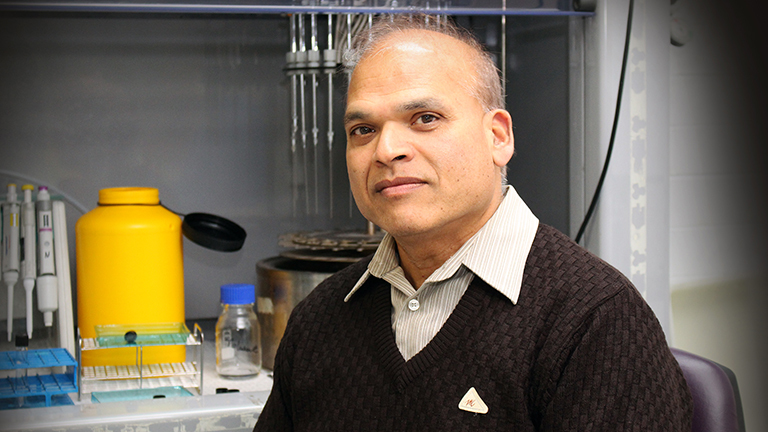 Professor Manohar Garg occupies a Personal Chair in Nutritional Biochemistry and is the Director of the Nutraceuticals Research Unit at the University of Newcastle. He is also the Co-Director of the Clinical Nutrition Research Centre, which is a cross-institutional collaboration between the University of Newcastle, University of South Australia and the Swinburn University. Recently he has also been appointed as a Honorary Professor of the Riddet Institute (National Centre of Research Excellence) at the Massey University in New Zealand. He is a world authority on fatty acid nutrition; anti-inflammatory, anti-aggregatory and anti-oxidant benefits of bioactive nutrients (particularly resveratrol), carotenoids (the orange part of carrots and other foods), phytosterols (plant-based steroids) and omega-3 fatty acids, He has fostered strategic alliances with the food industry to develop functional foods. Professor Garg has published over 200 publications in high impact international journals. He served as the Immediate Past President (20011-2013); as President (2009-2011) and President Elect of NSA between 2007-2009 of the Nutrition Society of Australia. He is the current Editor-in-Chief for the Journal of Nutrition & Intermediary Metabolism and Associate Editor for the international journals: Progress in Lipid Research and Journal of the Science of Food & Agriculture. Professor Garg was recognised as a Fellow of the Nutrition Society of Australia, a rare and highest award of the Nutrition Society of Australia in 2013. Professor Garg has been awarded the 2012 Professor Austin Doyle Medal in recognition of his outstanding contributions in cardiovascular sciences especially role of nutrition, in particular prevention of complications of cardiovascular disease by the Indian Society of Hypertension. He has also been awarded the 2012 Nutrition Society of Australia Medal. Professor Garg is currently working towards improving the health strategies for prevention of non-communicable diseases by non-pharmaceutical means. Nutritional supplements and functional foods for reducing the risk for the development of cardio-metabolic disease (eg obesity, diabetes mellitus and cardiovascular disease). Specilaise in fatty acid analysis of food fats and oils, body fluids and tissues. Validation of health claims made on nutraceuticals, functional foods and dietary supplements.